A useful fence perfect for Arena XC. The height is taken from the fixed centre of the jump. 2.4m long jump gives the best horseshoe shape, the 3m and 3.6m lengths will give a more open curve as shown right. The Spread on all sizes is approx. 45cm and the end height is approx. 1.5m. If used without poles the Horseshoe log can be approached from both sides. You can increase the height easily and safely with the knock down pole which is more inviting than a traditionally fixed Cross Country fence. Please note that if using a pole the Horseshoe log must only be jumped from approach for safety. The knock down height adjustability starts from the base of the straight section as shown on the photo of the rear of the jump left, not the bottom of the curve. Includes 1 matching pole and 1pr Safety cups. 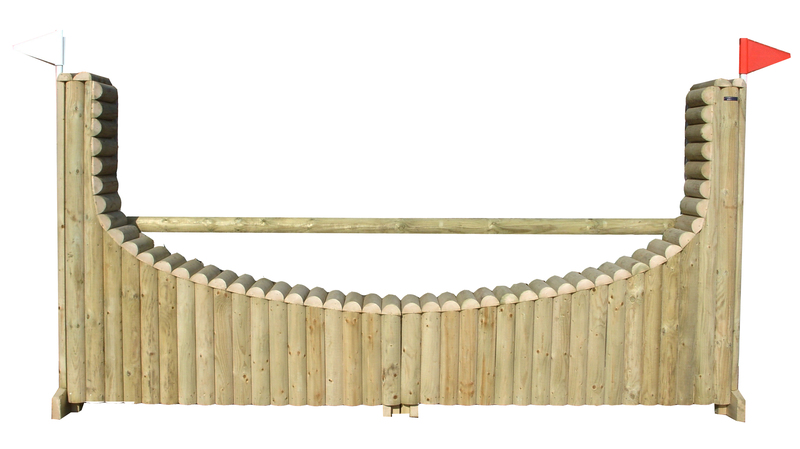 Horseshoe log fences always come in two equal length sections.